Welcome and thanks for riding by today. We're the Oliver family in Amarillo, Texas. We've been serving the American cowboy with quality leather goods for four generations. C. W. Oliver (Claude) started his shop in Vernon, Texas in 1917 and was later joined by sons Bill and Jack. They continued the tradition of serving the working cowboy under the name of Oliver Brothers Saddle Shop until Bill moved to Prescott, Arizona in the early 50's. Bill returned to his native Texas and opened the Bill Oliver Saddle Shop in Amarillo in 1960. Richard Oliver joined his dad and in turn has been joined by his sons in the shop. Each generation has passed along the knowledge and skills needed to build the best equipment possible for the working ranch cowboy, the pleasure horseman and the competing showman. Our pride runs deep in our saddles and tack that we build and use ourselves. Our saddles are handmade and numbered and we keep a record of every saddle we make. We can usually give you full information on any saddle we have made, just find the number on the cantle and give us a call. 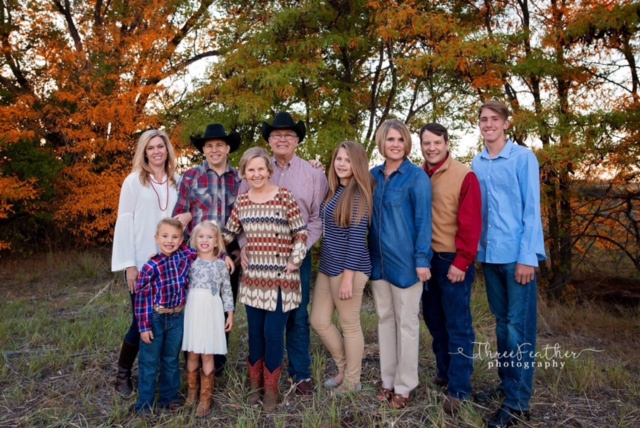 Richard and sons Bryan and Zeb Oliver combine to offer you over 70 years of personal experience in building ranch, cutting, roping and show saddles and tack. In addition to the Oliver family, Colt Vernon has been with us for 10 years since coming to school at WTAMU. Colt Vernon is building saddles as well as handling occassional repairs and strap goods. Andrew Cook completes most repairs and helps keep our strap good inventory built up. Hannah Morman builds our chaps and chinks, helps take care of customers, our website and social media and whatever else is asked of her. Stephanie Stokes is a current WTAMU student and helps with customer service, the website and social media. We are blessed to have such great employees. They all have a love for the western way of life and most own and are involved with horses. That about rounds out our crew and any of us can assist you in any of your needs when you come by or call. If you are ever in the area, please come by and visit - we love meeting new friends and visiting with old ones. The most familiar faces are from here in the southwest but friends have been made nation and worldwide.